Blair Athol is one of Diageo's picturesque workhorse distilleries and one of the crucial ingredients in Bells. Maybe not something to think too much about. What matters is that the stuff is usually good-great as a single malt. Nose: Heavy sherry, tonnes of sweet sherry with fruit cake and raisin. Very little of the distillery character. Taste: Sweet sherry with raisins and lots of sweetness, some building spice- Nutmeg and ginger. 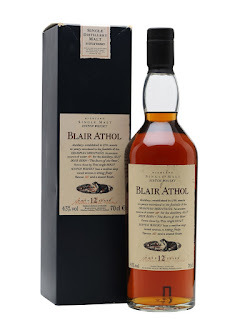 Again, not much balance, very sherried. Water: Softens with less spice and more malt sweetness- Orange. Finish: Sweet spice and some oak. Notes: A little overwhelmed by the sherry. 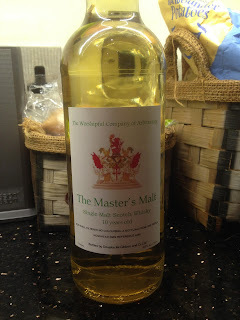 Tasted in The Whisky Shop. This next one is a bit different and you won't find this in a whisky shop, or online... or anywhere else come to think of it. This bottling is only available to buy if you are a member of The Worshipful Company of Arbitrators. Luckily, I know someone who is! Nose: Fruity with woody spice. Malty and nutty, spice- cinnamon, ginger, white pepper, oaky with spicy malt. Lots of cereal and banana. Water: Flavours emphasised one at a time then replaced by something else. More spice, then more banana, then more malt. Some stewed apple too. Taste: Spicy and malty. Oak, cereal, spices- ginger and white pepper. Very crisp and clean flavours. Water: More spicy maltiness. After time more very sweet notes- cocktail cherries. Finish: Short/medium length. Ginger spice fades gently but sometimes quickly with citrus. Notes: From a refill Hogshead. Overall lovely and easy to enjoy. The finish got better as the bottle went down.